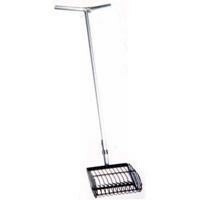 Mini Bull-rake - Rakes - GoClamming! Popular with commercial as well as recreational fishermen, this rake has an 11 tooth head. Set up with a 4 foot stationary aluminum T-handle and SS clamp. All put together and ready to go fishing!